I took a break from the intercontinental side of life and remembering our Nigerian roots when I went out today looking for a good place to review. This restaurant came highly recommended. Visible on the roads of Lekki Phase 1, at Plot 1 Blk 12, Admiralty Road, Lekki Phase 1, Lasgidi Buka is right beside the infamous Sailor’s Lounge. The ambience was quite nice with brick walls and African art and a thatched roof. This design really set me up for eating a good meal as I walked up to the counter where they had the food on display. I started feeling apprehensive at that moment because contrary to what I had imagined, I was limited in my choice of food. You’d expect the whole works from a Buka right? That wasn’t the same here. 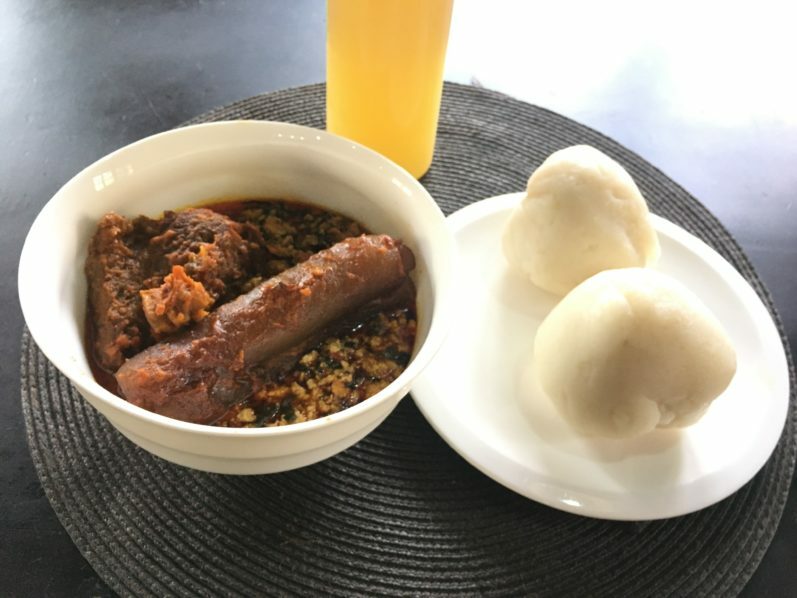 Punded Yam and Egwusi soup. I settled on eating ‘swallow’ and I ordered for pounded yam and egusi soup with beef and cow leg. Sound like a meal right? I also decided to try out their sugarcane extract with the meal. As I had my first taste of the meal, I was reminded of my mother’s soup which was probably sitting pretty in the fridge at home and how this meal was nothing like it, not even close. The pounded yam was already wrapped and cold, which I didn’t enjoy. The soup which was ‘microwaved’ wasn’t as hot, regardless of this, it didn’t live up to the taste of any Buka I have tasted. Which is why I have decided that if you decide to eat local, it better be local. There were no ‘obstacles’ in the soup which was a huge turn off for me. Or am I the only one who expects to meet little protein stoppers with her swallow? Asides for that, the soup tasted quite bland and only came to life in the little places the spice decided to flourish. I could barely finish my meal. The sugarcane extract juice was not as nice as I had expected either. The extract-juice which also contained lime and ginger was more of ginger-based than sugarcane. I took this home with me to see if refrigerating it some more would help with the taste of the juice. Would I be going back to Lasgidi Bukka? Certainly not. I hear their jollof rice is great but I know I can get better for a decent price without breaking the bank.